Un coprolito de un guajolote contenía primordialmente maíz (Speller et al. 2010: SI, p.1). 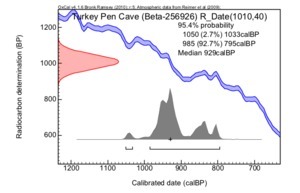 2010 Ancient mitochondrial DNA analysis reveals complexity of indigenous North American turkey domestication. Proceedings of the National Academy of Sciences, USA 107(7):2807-2812.